The Locale contains the status of your local feature. 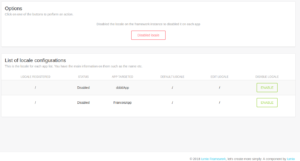 You can enabled/disabled the locale on the framework instance to enable it on each App. If you click on “Enable” you change the status of your App. This list give you the locale registered (locale/URL), the status, the App chosen and the default locale. 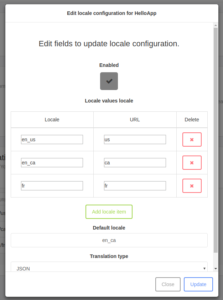 You can modify the default locale and the translation type.